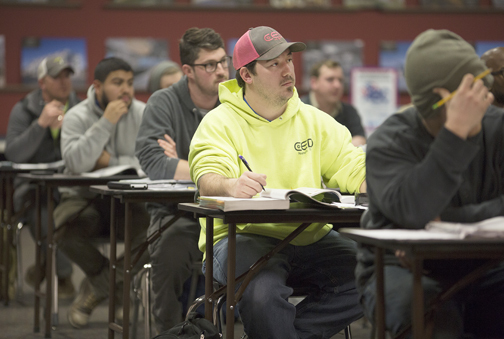 Caleb Murphy, 26, a second-year student studying to be an electrician, during class at Associated Builders and Contractors construction school. In his previous job, Caleb Murphy was a member of a U.S. Army explosive ordnance disposal unit – “the bomb squad,” he explains more bluntly – in Afghanistan. Now he’s working full time while attending night classes preparing him for a career as an electrician. “It’s one of my best things, working with my hands,” Murphy adds. The classes he attends two nights a week aren’t held at a community college or one of Tennessee’s public Colleges of Applied Technology. Moe Dillingham has been teaching for at ABC for 23 years. He’s seen steady growth in his classes, and now has 39 students. The entire school has close to 300 students. Murphy and 38 other second-year students are at the Elm Hill Pike headquarters of Associated Builders and Contractors, a trade group whose members are contractors in the commercial construction industry. 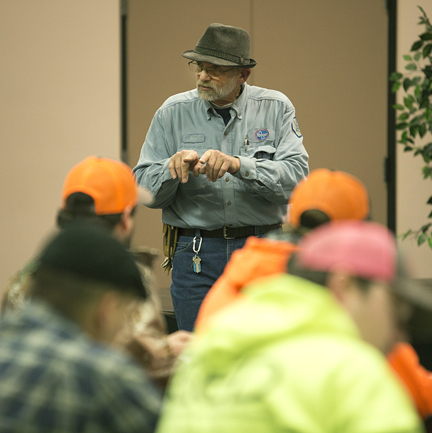 In classrooms throughout the building, other students are attending four-year programs in plumbing, carpentry and heating, ventilation and air-conditioning – HVAC – systems. Currently, 330 students are enrolled. Their employers pay their tuition. Murphy’s class is so large that Michele Correnti, ABC’s education director, had to move it from a classroom into a large space resembling a hotel ballroom. “Over the last two years, it has been growing. We’re out of space,” Correnti says of ABC’s training program. ABC’s members are actively recruiting people like Murphy. They face a growing shortfall of skilled tradespeople. As experienced employees age out of the workforce, there aren’t enough younger people to take their place. The industry estimates that for every five skilled workers who retire, only one person is in line to fill each position. “ABC’s school has higher enrollment than they’ve ever had,” adds David Stansell, CEO of Stansell Electric Co. and past chairman of ABC’s board of directors. The industry is pinning its hopes on people like Murphy and Joshua Hughes, another second-year apprentice electrician. His employer is preparing him for a management position. This is a good time to be in the building trades in Nashville, Hughes says. The city’s population is growing, and so is demand for new commercial construction. Murphy took a look at the industry and saw an opportunity. “I had a family member in the electrical trade and knew a lot of construction was going on,” he points out. Moe Dillingham, who is teaching, says that after four years of school, his students will become journeymen electricians. The shortfall in skilled labor grew over time, explains Toby Compton, ABC’s president. “Culturally, over many years, schools cut back on their shop programs” and steered students toward college. Teachers would “tell you if you don’t do better, you’ll be a ditch digger. But those guys are making good money,” Compton adds.